What is it about stories of split identities that so fascinates? Jesse Eisenberg plays two of a kind in The Double — both Simon James and James Simon. Jake Gyllenhaal starred in Enemy earlier this year. Fellow scrawny star Michael Cera played two in Youth in Revolt. Fight Club. Dead Ringers. The list goes on. As someone who tries to manage different identities online, I can attest that it’s a real problem — at least for some of us. Maybe we fractured wish we were more decisively one-sided; we all long for a Jekyll to pull us out of our Hydes. In The Double, Eisenberg plays the split personality to an extreme. As Simon, Eisenberg is a cowardly, wispy, nobody. His catch phrase is “sorry” — assuming he can manage to speak at all. As James, he’s hottest go-getter in the whole office. The film is set in a dystopian bureaucracy somewhere. The production design (by David Crank, There Will Be Blood) recalls Brazil or Delicatessen, but less fun. The office is lit with sickly yellow lights. Simon, whose suit is a size and a half too big, has worked here for seven years. Yet the security guard still doesn’t recognize him, so he has to sign in every day. He looks forward to a mandatory company party where he can maybe say hi to the girl he likes, but he gets kicked out for lacking an invitation. When Simon’ James double, James Simon, shows up, the office manager played by Wallace Shawn cheerily announces that James was “the only employee to survive the cull at our sister office.” The new guy is gregarious and popular, casting an even longer shadow over Simon’s already dark life, especially when James starts taking credit for Simon’s diligent work. 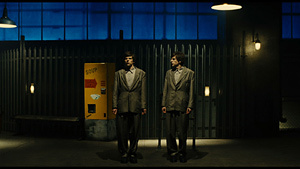 The Double is based on a novel by Fyodor Dostoyevsky and the setting and tone recall Kafka and Orwell. I was tempted to write that the society in the film was cruel and oppressive — after all, the police have a special suicides unit, one for each neighborhood, and they still can’t keep up. But not everybody is as miserable as Simon. Authority figures and service providers (Cathy Moriarty plays the surly waitress) seem to enjoy their petty tyranny. Their ability to cope with an ugly world makes Simon seem all the worse off for not fitting in. I don’t know if I’ve lost patience for all shy-guy protagonists, or if Eisenberg’s Simon is more extreme than others. He is so hopelessly introverted that I feel less sorry for him than I do for the other characters written to be his friends or, God help them, love interests. Simon doesn’t just have a little shyness to overcome, but a neurotic disorder. I’m not an expert on Dostoyevsky, but it seems he didn’t always make his characters redeemable. Yet the movies seem to require some sort of redemption at the end, and director Richard Ayoade allows a smidge. As unlikely and dramatically undeserved as it is, at least it comes at a suitably high cost. For what it is, The Double is well executed. The visual style and bleak story fit hand in glove. Casting and acting work well within the film’s world. If you’re a connoisseur of dystopian surrealism, you should at least give The Double a try. Still, this is not my cup of tea. For me, The Double lacks the grandeur and humor of Brazil, and the warmth of Jeunet and Caro’s films such as The City of Lost Children.